Price shown may not be correct. (photos are example of color only, not pieces you will get). Custom printed 100% Authentic Lego part. New parts and deals are always being added. 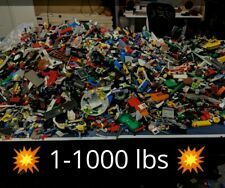 A nice mix of new and used Legos in good, clean condition! These are the small Lego size for older children. Photo was taken from our large inventory is only for reference to show the types of pieces in these lots. 1000 pieces only. Very small. New parts and deals are always being added. Clearly used allot, enough to cause significant signs of wear. Up for your consideration is this nice LOT of (gently played with) Lego blocks. This is a miscellaneous lot of several different sets. This LEGO item is used. All of the blocks are used but in GREAT condition. 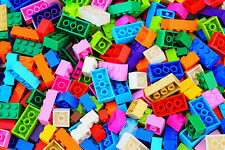 You will receive a random and varied lot of bricks with many different colors. The picture is of the EXACT container that these bricks will be from. (14) 1x1, (30) 1x2, (4) 1x3, (6) 1x4, (2) 1x6, (1) 1x8, (23) 2x2, (10) 2x3, (8) 2x4, (1) 2x6, and (1) 2x8. The photos are just examples of the types of pieces in these lots. You'll receive 100 Lego pieces, not everything pictured. Marks/Scratches From Play Possible (See Photos). 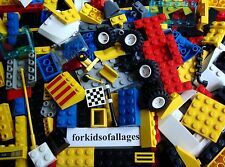 Lot of 200 Lego Finishing Tiles. They are smooth on the top, so a great way to finish off your pieces and give it an authentic look. Each lot will be a mix of all sizes. It will be a fairly even mix of these types--it won't be all tiny pieces, for example. LEGO Raised 3D Baseplate 30271 Grass Rocks Water 15” X 10” . Has a little indentation in one corner, (see photo), otherwise is in very good condition! Lego Friends Lot of 10 Minifigures - Create Your Own Friends + 20 Accessories!!! You will receive 40 Lego Friends Pieces as Follows: (10) Head Pieces (10) Hair Pieces (10) Torso Pieces (10) Leg Pieces Bonus (30) Lego Friends Accessories All of the pieces are in excellent condition and are 100% authentic LEGO Brand! All 40 body Pieces will be selected randomly from a bulk lot! Let your kids build their very own characters and use their imagination! If you have any questions please feel free to contact me. Thank you for looking and for your time! 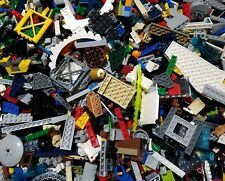 You will get at least 15 0 pieces that will be pick at random from a huge Lego lot.The lot in the picture is for you to have an idea of what you may be getting but you are not getting everything on that lot or that specific lot. HUGE Bulk of Lego Friends Furniture LOT as pictured. All pics updated. Condition is Used. You will get at least 100 pieces that will weight at least 8 oz or 1/2 lb. Pieces will be pick at random from a huge USED Lego lot.The lot in the picture is for you to have an idea of what you may be getting but you are not getting everything on that lot or that specific lot. Lego Parts will be from the friends line or colors that go with the friends line. 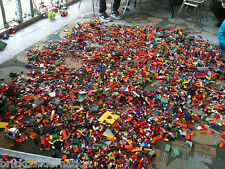 A: Varies based on sample but 250-450 lego parts is a reasonable estimate. Q: What is the maximum order?. The photos were taken from our large inventory and are just an example of the types of pieces in these lots. You'll receive 100 Lego pieces, not everything pictured. Eachlot includes 150 Lego 1x1 dot round plates! These are the small Lego size for older children. Photo is of one lot and is to show an example of what you may receive. (Base plate is not included.). Lego new mini figures animal parts and color content: X5 dark Tan chicken X5 white chicken X5 white chicken X1 reddish brown Adventurers Chest container box To get combined shipping make sure to go Ebay full site cart to click on “request total from seller” to receive a revised invoice for payment,thank you. 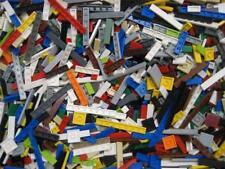 50 pc Bulk lotGenuine Authentic Lego Printed or Stickered slopes randomly selected from our large collection! Printed or Stickered slopes! Including pieces for Space, City, Plane, Arctic, Racing. LEGO Building System. Lot weighs 9 ounces and has 234 pieces. 60 sky blue assorted bricks. 9 olive green slope and 1x2s. 25 beige assorted bricks. (photos are example of color only, not pieces you will get). New parts and deals are always being added. LEGO Bar 4L Lightsaber Blade / Wand / Staff / Rod lot of 25 Mixed Colors. Each lot of 25 will be picked at random from the huge lot in the photos . due to photography lighting, color may slightly different, baseplate in photo is for scale and contrast and is not included in the sale. 1-10 Counting & Pictures Building Blocks. Any item is eligible for local pick up. (photos are example of color only, not pieces you will get). New parts and deals are always being added. Price shown may not be correct. 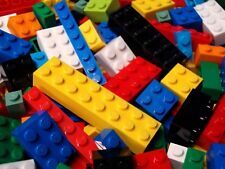 Each order is for a lot of 100 basic Lego bricks in a variety of color and sizes. 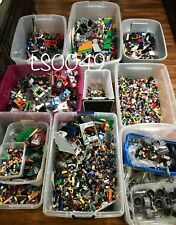 Lego 100 Bulk Blocks Bricks Mixed Lot sizes Basic Building Pieces. 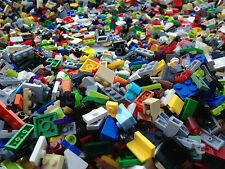 These are the small lego pieces for older children, not large duplo size. Over 100 of your parts will be larger than a 1x2 brick. About 150 will be 1x2 or smaller. A good variety mix. All genuine Lego. Mostly newer colors, but bc it is a bulk mix there will be all color versions mixed in. Lot of 100 Lego Finishing Tiles. They are smooth on the top, so a great way to finish off your pieces and give it an authentic look. Each lot will be a mix of all sizes. It will be a fairly even mix of these types--it won't be all tiny pieces, for example. New ListingDuplo Various Colors Lot 20 curves and slopes. New ListingNew Lego Factory Sealed Bag #5 Of Unknown 2007 Set. Condition is New. • not a complete set. Bag number 5only – unknown set from 2007. 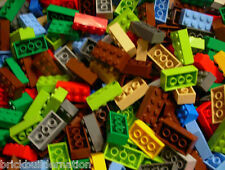 These are the smaller size LEGO bricks suitable for ages 5&up. (unless stated otherwise). BUT MUST BE PAID ON ONE INVOICE!